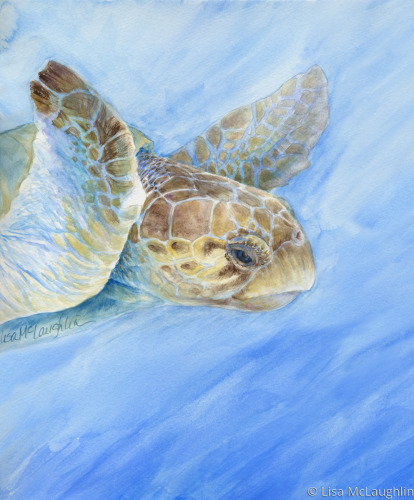 See and feel the wisdom in the face of this old sea turtle swimming past. 6" x 5"9.75" x 8"13.25" x 11"17" x 14"20.5" x 17"23.25" x 19.25"
Rich color, lots of personality. 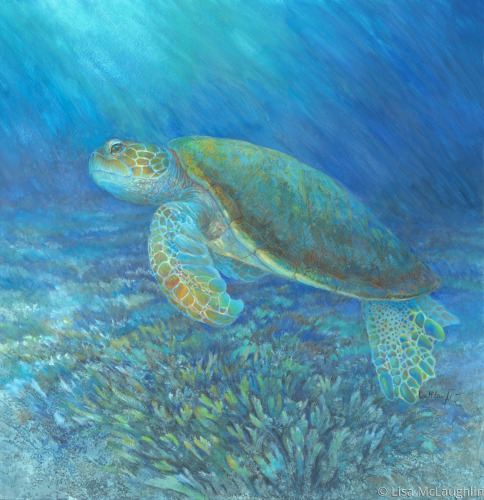 Sea Turtle swims by and engages the viewer. 5.25" x 5"11.25" x 11"17.5" x 17"23.75" x 23"30" x 29"35" x 33.75"
Calm and peaceful under water world. A delicate watercolor. 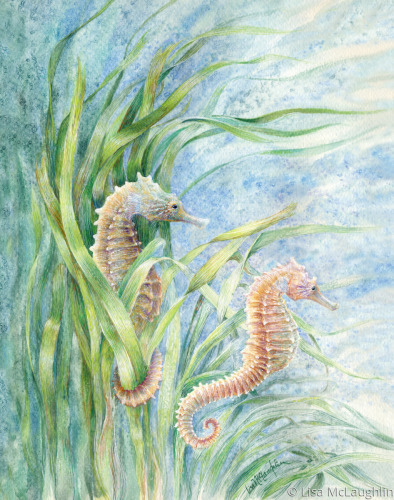 A mated pair of seahorses float along together amongst the seagrass. This sensitive, whimsical original watercolor painting is available for purchase, please contact. 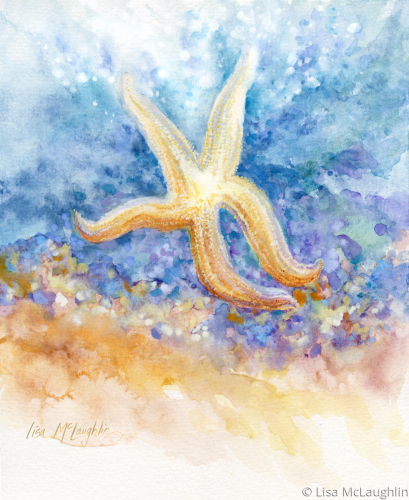 6.25" x 5"7.5" x 6"8.75" x 7"10.25" x 8"11.5" x 9"14.5" x 11.25"
Whimsical watercolor painting of a starfish going back to the ocean. The unframed original is available for purchase. Please contact. 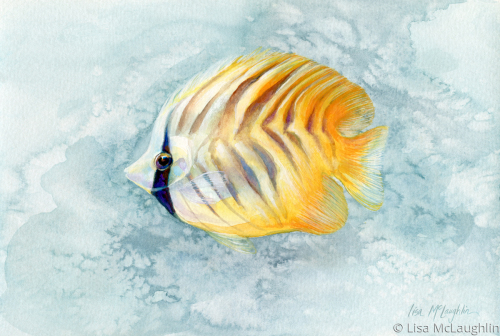 Whimsical watercolor painting of a tropical fish. The unframed original is available for purchase. Please contact. 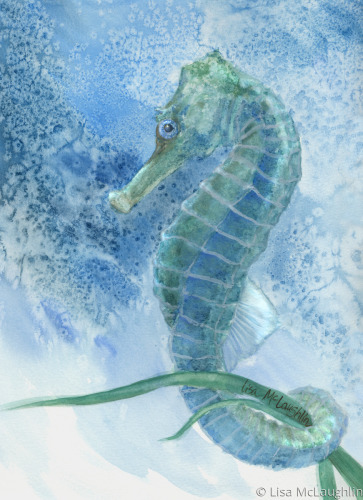 Beautiful watercolor study of a seahorse. Peaceful. Simple. A Lisa McLaughlin original painting. 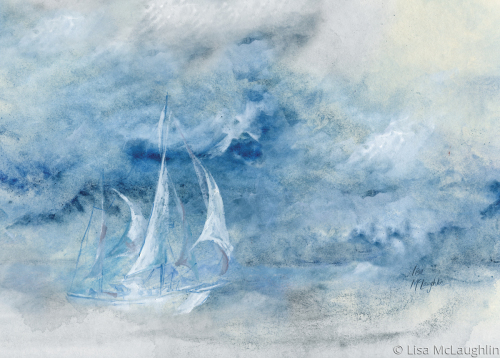 5" x 5.25"11" x 11.5"17" x 17.75"
Impressionistic Watercolor painting of a ship in an ocean storm. The wind is blowing the sails at full strength. Blue, white, silver grey storm clouds. The ship is white and ghost-like against the raging sea. The original painting is not for sale. 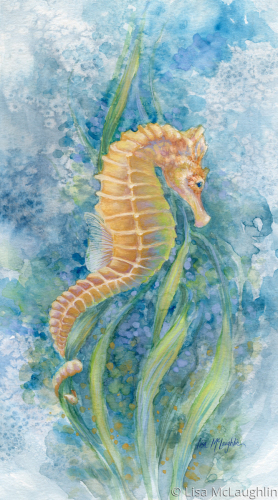 5" x 7"9" x 12.5"13" x 18.25"17" x 23.75"21" x 29.25"25" x 35"
Perfect subject for a watercolor painting, sweet blue seahorse in a peaceful underwater world. Whimsical original McLaughlin watercolor has been sold. 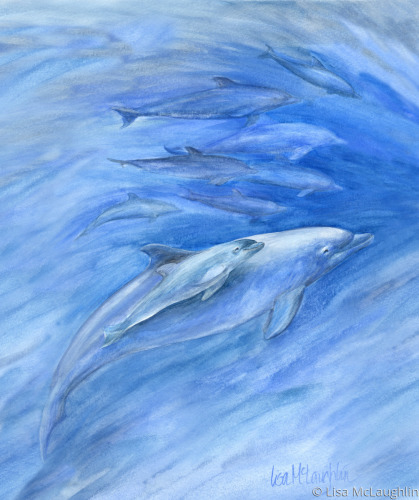 Dolphin mom and baby swimming together, share a quiet moment. Rich deep blues. This original McLaughlin watercolor has been sold. 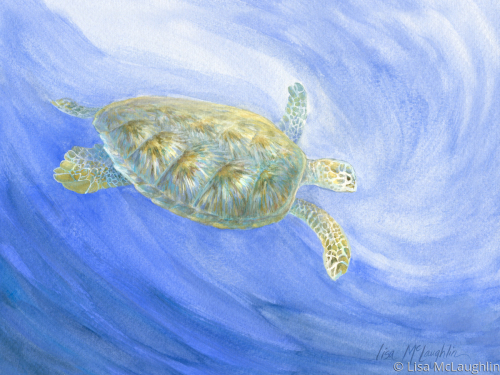 6" x 5"9.5" x 8"13.25" x 11"16.75" x 14"20.25" x 17"23.25" x 19.5"
Whimsical watercolor painting of a sea turtle swimming peacefully into the depths of the ocean. A Lisa McLaughlin original. The unframed original is available for purchase. Please contact. 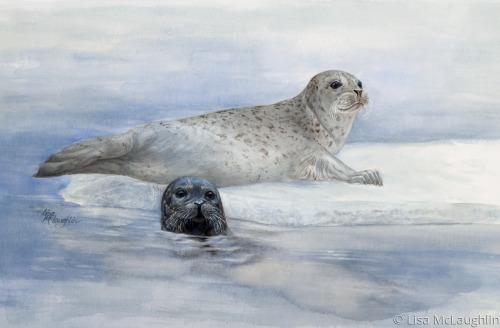 Watercolors are the perfect medium for this wintery, peaceful ocean vignette. Big soulful eyes on this mated pair of seals relaxing together. A feeling of warmth in a color pallette of wintery blues and grays.